As the Netherlands gears up for its general election in March, Dutch far-right politician Geert Wilders is laying out his stall to the electorate, including a promise to crack down on "Moroccan scum" in the country. "The Moroccan scum in Holland... once again not all are scum... but there is a lot of Moroccan scum in Holland who make the streets unsafe, mostly young people... and that should change,” he told reporters. "If you want to regain your country, if you want to make the Netherlands for the people of the Netherlands, your own home, again, then you can only vote for one party." The Freedom Party leader tweeted a link to an article detailing his remarks, as well as numerous pictures of him with his supporters. 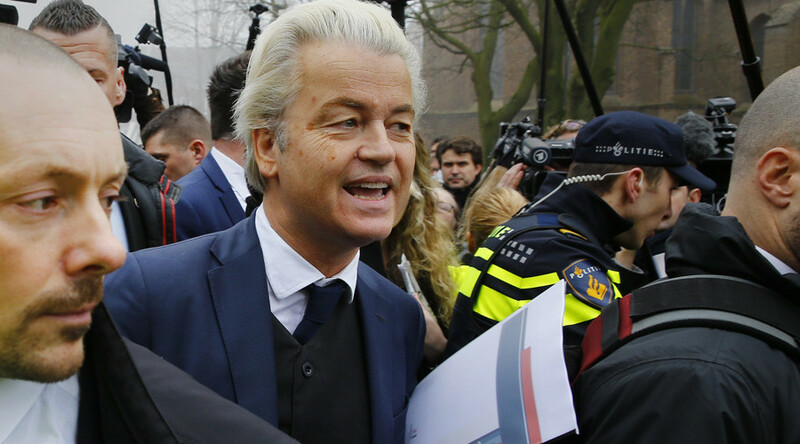 Despite his controversial statements, Wilders and the Freedom Party lead opinion polls with 17 percent, ahead of the March 15 election. His party’s top priorities are to ban Muslim immigration, shut down all mosques and to leave the European Union. "Despite all the hate and fear-mongering of the elite both in Britain and Brussels, people took their fate in their own hands," he said. "I think that will happen in Holland, in France, Austria and in Germany." His views have angered many of his political rivals, however, with Dutch Prime Minister Mark Rutte attacking Wilders and his party last month in an advert published in a number of newspapers. "If you live in a country where you get so annoyed with how we deal each other, you have a choice. Get out! You don't have to be here!" the advert read.